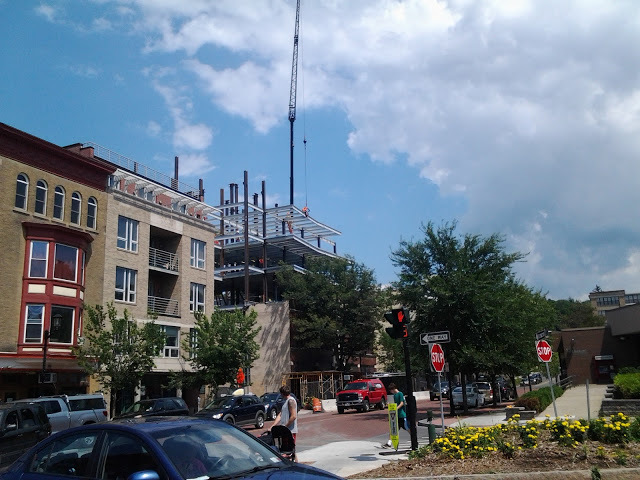 Another Collegetown construction project is getting its first real progress report. This time, it’s 327 Eddy Street in Collegetown, also known as the “Dryden Eddy Apartments”. 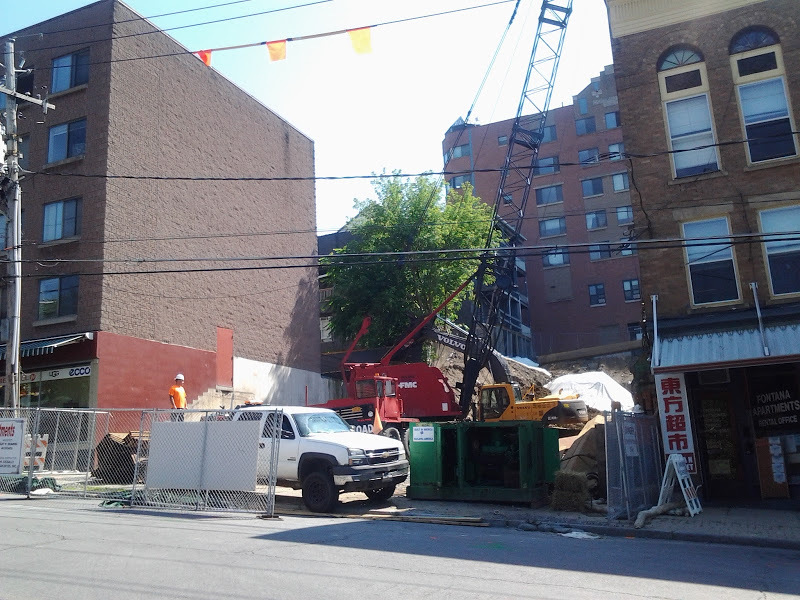 Excavation has been underway for a little while now, since the old Club Sudz/Tung Fong Grocery came down earlier this summer. The Club Sudz building had been built around 1910 as a 3-story building, but the structure was partially destroyed by a fire in 1970, and only the bottom two floors were rebuilt. These photos are nearing two weeks old now, but a more recent photo taken by Mark Anbinder shows steel sheet piles on site. The project will use “flowable fill” to a depth of three feet in its foundation. Flowable fill is an alternative to concrete and is often used in roadwork or as retaining wall backfill. What comes in its place is a 5-story building broken into three stepped sections. 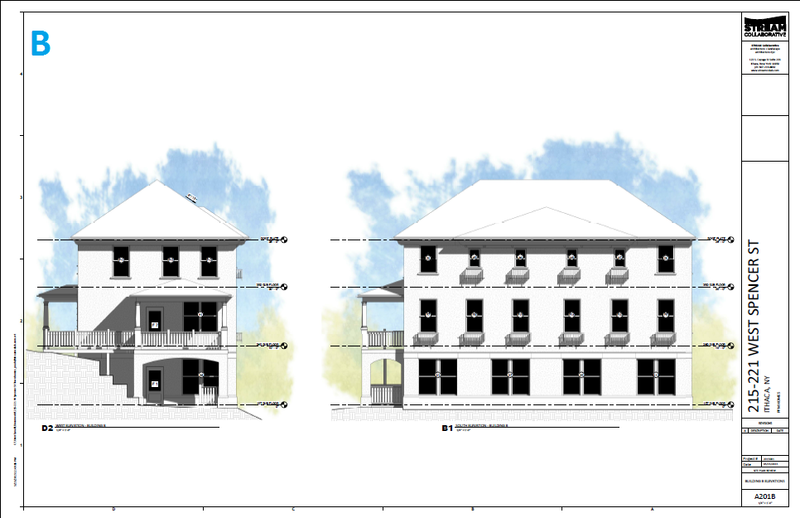 As elevation increases going eastward, the building steps back to another five-story section. Initial plans approved in 2014 called for a 6-story building with a different crown treatment (which looked better, in my opinion). Somewhere along the way, the building lost a floor, and then very shortly before construction began, the crown was changed from a triangular prism to a glass box. Presumably, this doesn’t affect the appraisal for the crown projecting into the city’s right-of-way. The new 5-story building will bring 1,800 SF of retail space and 22 new units with 53 bedrooms to the market in August 2016. 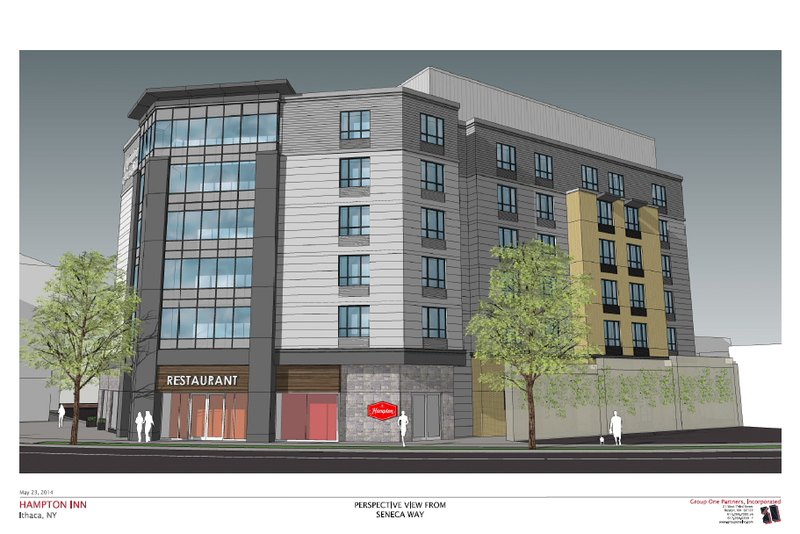 Longtime Collegetown landlord Steve Fontana (of the Fontana’s Shoes family) is the developer, Jagat Sharma is the architect, and GM Crisalli & Associates of Syracuse will be overseeing construction. 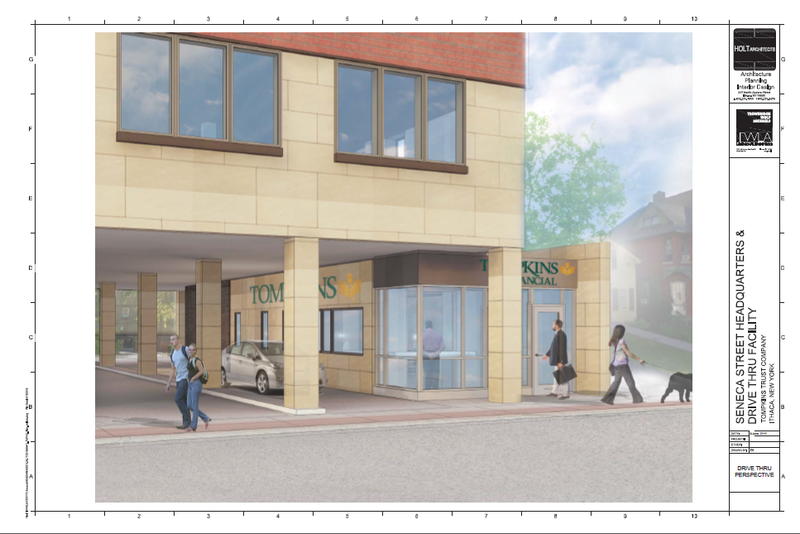 A construction loan of $4,824,000 is being provided by Tompkins Trust Company. 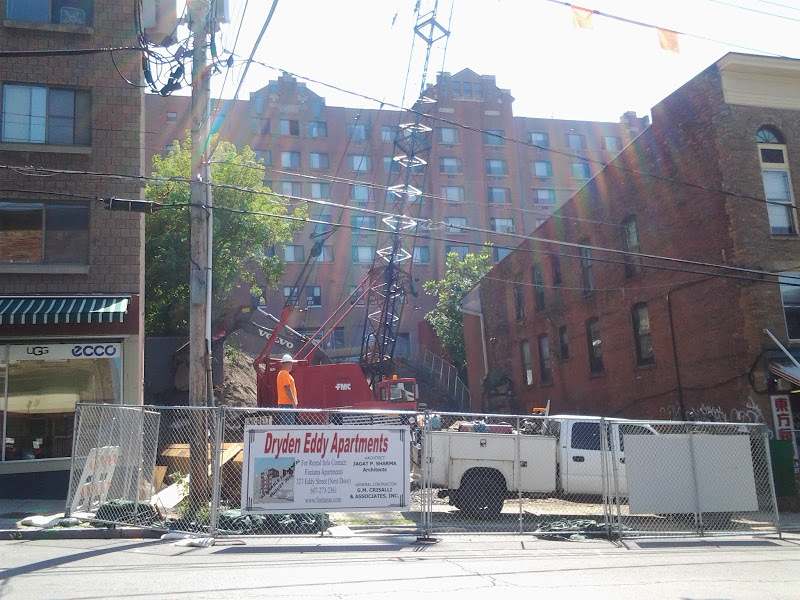 Demolition work has commenced at 205 Dryden Road, also known as “Dryden South”, in Collegetown. 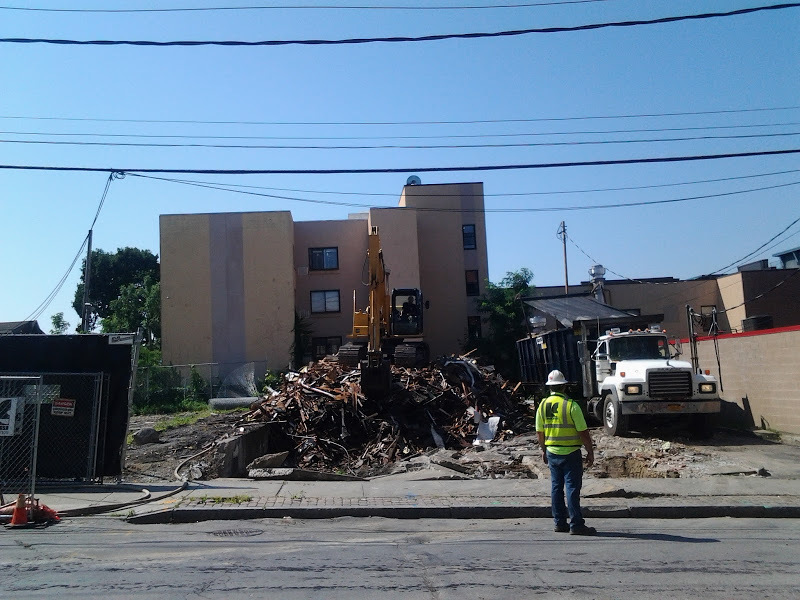 Only a pile of debris indicates where the old Kraftee’s building once stood. Once the site is cleared, Excavation work and pile driving for the foundation can begin. When completed in August 2016, 205 Dryden, a 6-story, 65-foot structure, will house Kraftee’s in 2,400 SF of retail sapce on its ground floor, and 2 4-bedroom apartments on each of the upper five floors, for a total of 10 units and 40 bedrooms. Kraftee’s is one of the local private college department stores, and opened its second location in Ithaca in December 2002 (the first store opened in Herkimer in 1989, moved to Oswego in 1990, and is still open today). Owner/developer Pat Kraft bought 205 Dryden in August 2004, and in January 2008, moved the store to the old convenience store next door (325 College Avenue, now the home of PopShop). 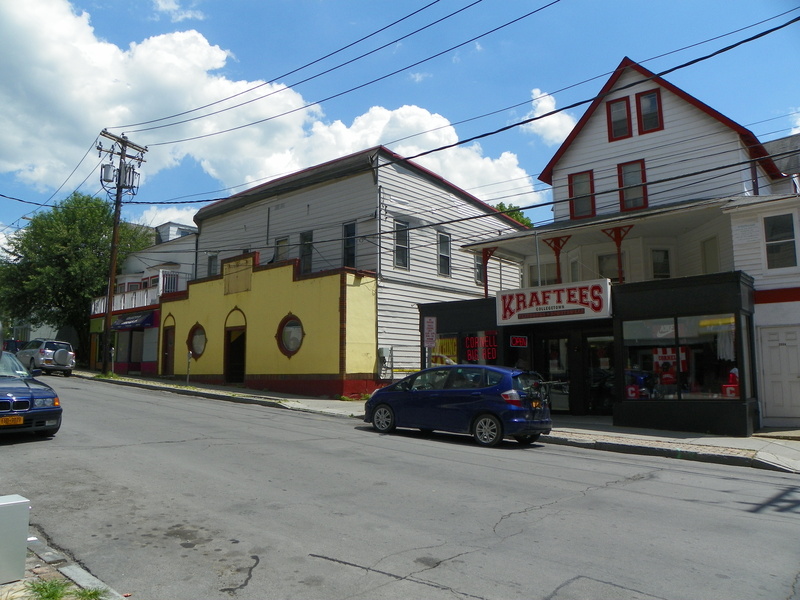 In fall 2011, Kraftee’s moved back into the Dryden Avenue space after 325 College was sold to John Novarr, and he decided to not renew Kraft’s lease. Now, with the new build underway, Kraftee’s is temporarily housed at 315-17 College Avenue, in a space rented from the Lambrou family. 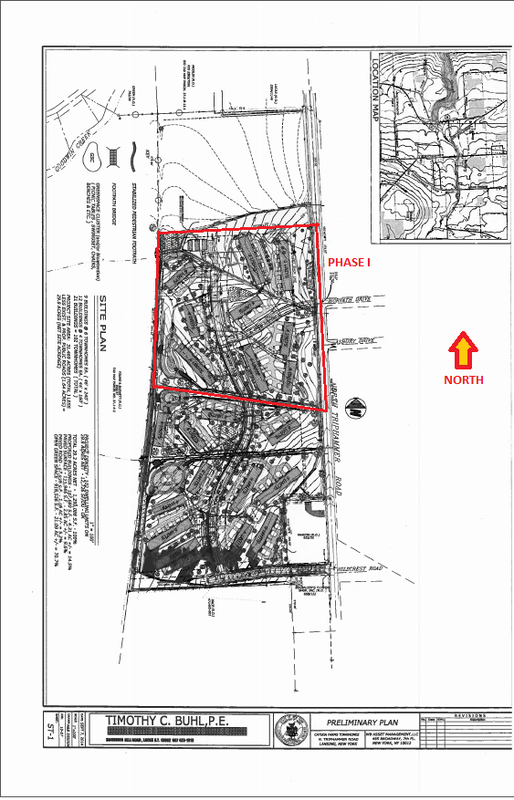 As previously discussed, plans for a new building on the Kraftee’s property have been in motion for a while – since at least 2009, according to Dryden South’s website. 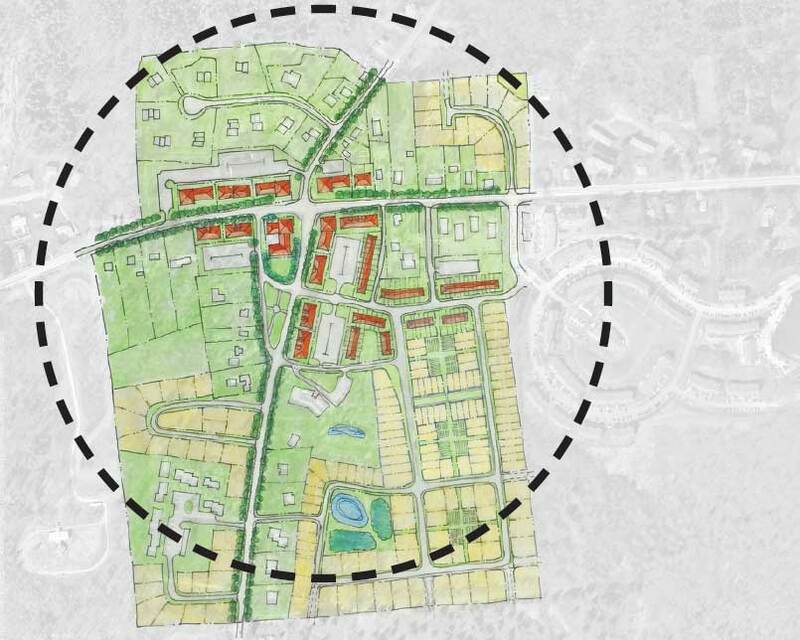 Formal plans, however, were not presented until May 2014, after the new Collegetown zoning went into effect. Plans were approved last August, but given the student renting cycle and rented units in the upper floors, work on the site began only recently. According to county records, the project was extended a $6,400,000 building loan from Oswego-based Pathfinder Bank on July 14th. Prolific Collegetown architect Jagat Sharma handled the design, and Rochester-based LeChase Contruction is in charge of the build-out. 1. I asked someone familiar with the State Street Triangle how the presentations went this week. “About as well as could be expected” was the diplomatic response received in turn. The Times, Journal and Voice all devoted coverage to the controversial project this week since its CIITAP application was up for review, as well as revised plans being brought forth to the planning board. 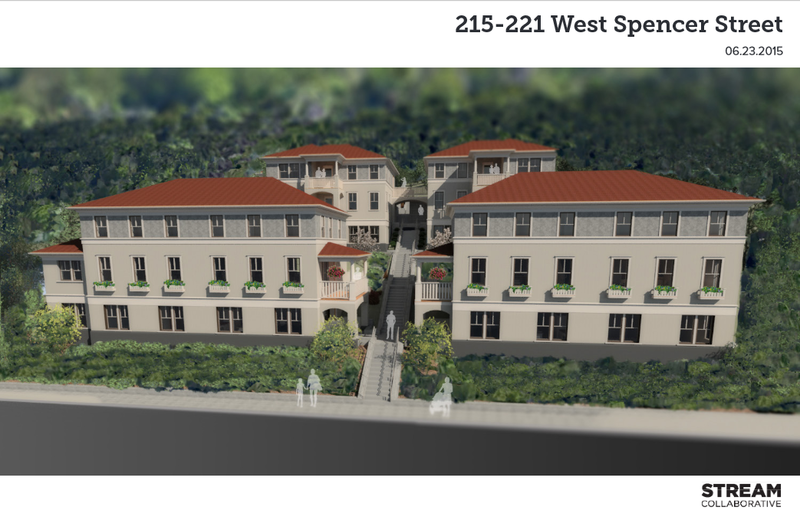 The project draws detractors from different angles – some because of size, some because it’s student housing, some because of the tax abatement. The tax abatement is what confuses me somewhat, for reasons related to the theory I wrote up a few weeks ago, which no longer holds water. My own personal thought was that a sort of economy of scale would kick in with greater site efficiency, negating the need for a tax abatement. That isn’t to say that they still couldn’t try for one, because it meets all the CIITAP requirements, just that they didn’t need it (it would have been proverbial “icing on the cake” if granted). But now they’re saying it’s the only way to move forward. I don’t know the financials and what their necessary ROI is (and probably never will), but I’d happily listen to an explanation. But the point I made in the piece still holds true – if Jason Fane’s project a couple blocks away was rejected for not having enough of a community benefit, market-rate student housing, even that which generates an extra $7.36 million in taxes over a decade, is going to be a big stretch, unless they plan on using the sheer size of it as a selling factor. The city planning board doesn’t have to worry about the controversy, because the project conforms wholly to a central business district zone. It’s going to be the tax abatement issue that makes or breaks this proposal. The article then goes on to detail how after the sewer initiative was defeated by public vote, a few developers banded together to try and fulfill the town center that Lansing was pushing for. Quoting the article, “the town government couldn’t get its act together to make that happen, even though it wouldn’t be footing the bill for the infrastructure (including sewer)”. About the only development initiative that has taken off is the Warren Road corridor, which was spurred mostly by threats of a major employer (Transonic) leaving the town (and Transonic paid for the sewer study). Meanwhile, the Star characterizes the village government as simply existing for “maintenance” purposes. The paper notes some successes with parks and wildlife initiatives, but the highlight of the piece seems to be that Lansing is routinely failing to achieve its municipal planning and development goals. 3. 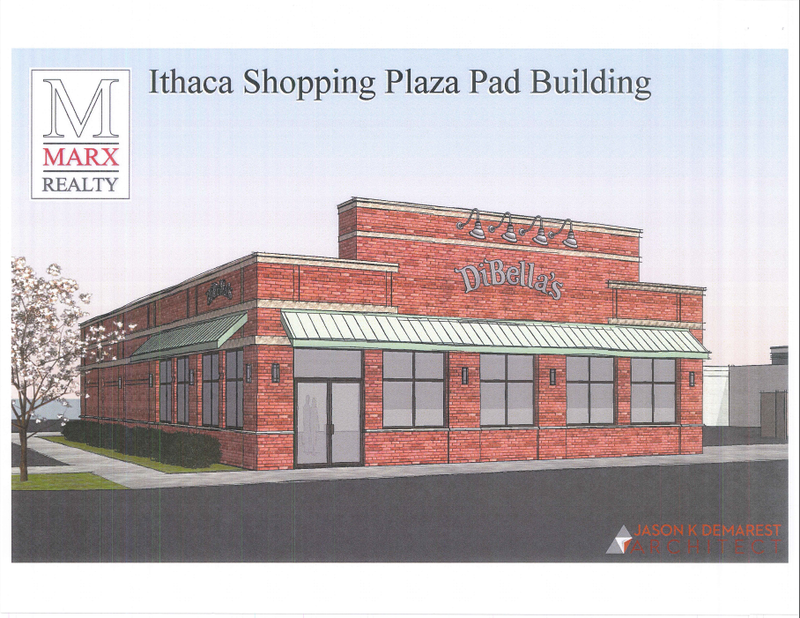 Back in Ithaca city, plans are underway for the major renovation of a shopping plaza into professional office space for a local architecture firm. 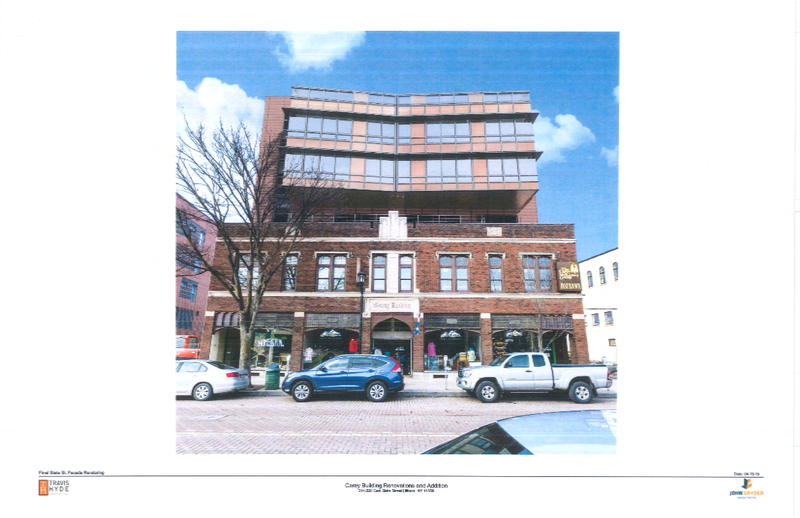 According to documents filed with the county, an LLC associated with HOLT Architects is spending $897,500 on the renovation, and another $415,000 for acquisition costs. The renovations will start in late August should be completed by March 2016. Tompkins Trust Company is providing the financing, and local company McPherson Builders is in charge of general construction. From the press release published late Friday, HOLT chose the West End location for its walk-ability and centralized location. The building will be renovated into a net-zero energy structure for the 30-person architecture firm. No renders yet, but they’ll be included in a future news roundup when they become available. 4. As written in the Voice, College Crossings at the corner of East King Road and Rt. 96B in Ithaca town is back to the board for revision number three. This one increases the project by a floor, 13,000 square feet and six more apartments. It’s been no big secret that developer Evan Monkemeyer’s had difficulties getting the project off the ground (he resorted to Craigslist for marketing the retail spaces), and given a total of 18,000 SF spread among 8 apartments (doing the standard 15% deduction for circulation/utilities, one gets over 1,900 square feet per apartment) these units are almost certainly geared towards IC students. A solid market since they’re next door, though not likely to elicit warm fuzzies from the neighbors (although based off the response on the Voice’s facebook, most people just don’t care; if only 210 Hancock had it this easy). Previous plans can be found here. Personal opinion, I’m a little disappointed in the revision. 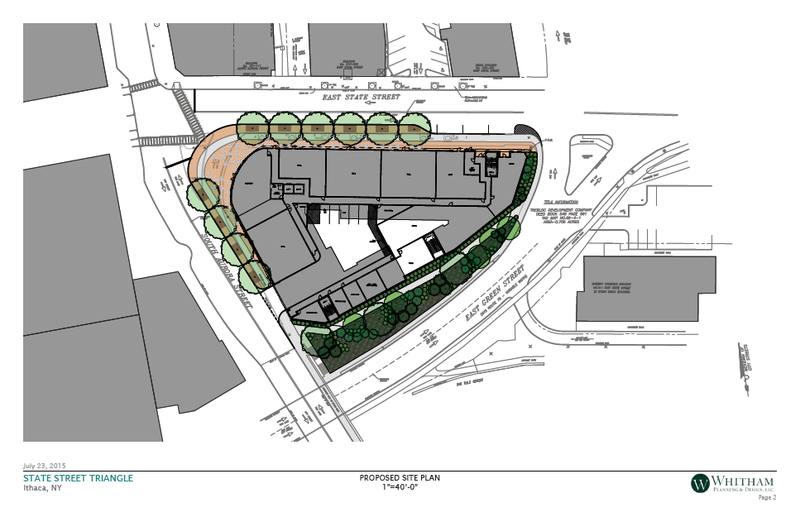 The mixed-use aspect is fine, but I was hoping the developer would tap into some of the ideas presented for the land by Form Ithaca instead of plopping a building in the middle of a 120-space parking lot. Monkemeyer owns a lot of acreage in adjacent land parcels, so this doesn’t bode well for a “walkable center” in Ithaca town. 5. 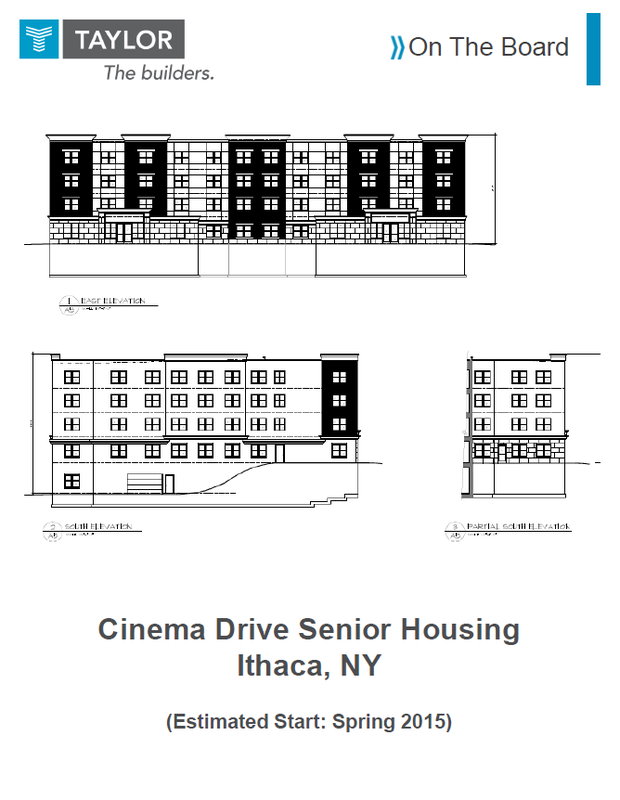 Ithaca Neighborhood Housing Services (INHS) is armed with more 210 Hancock studies and analysis as it prepares to go in front of the city Board of Zoning Appeals next Tuesday. With the commercial loading space question settled, it leaves the height variance of 6.5 feet (40 feet zoned, 46.5 feet requested), and the parking variance of 20 spaces (84 required, 64 given). Original/full application here, new addendum analyses here. The board requested additional information about pile driving and the parking situation. 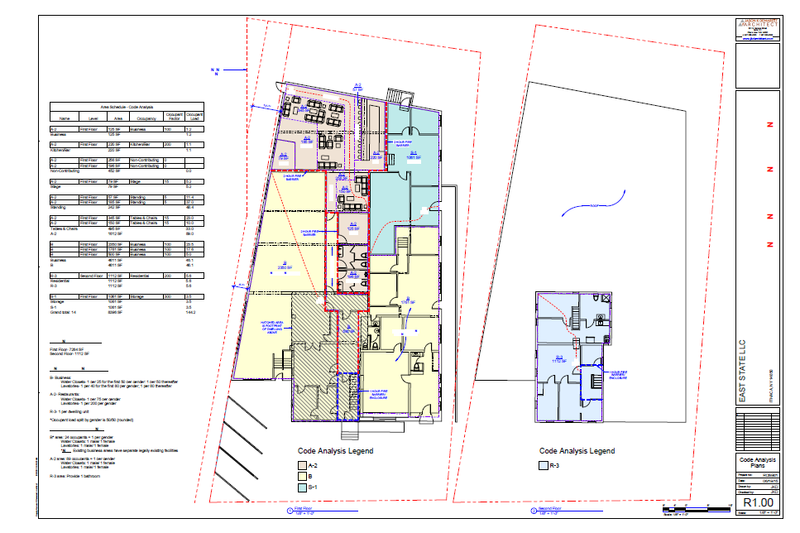 In response, INHS has conducted further analysis and shown that, 40′ or 46.5′, piles would be required either way. INHS has offered in its application to use a “vibratory oscillating” method of pile driving, where piles are vibrated into the ground rather than driven. This reduces noise (no hammer-like banging) and produces less overall vibration. Further parking studies found that 210 Hancock offers a greater percentage of parking than similar buildings like McGraw House, the Cayuga Apartments and Lakeview on Third Street, INHS’s parking study of its tenants was reiterated, and an analysis of its commercial tenants was given – the occupants will have 16 designated spaces from 7 AM to 5 PM, when the daycare and non-profit offices are in operation. After hours, they’ll serve as potential overflow parking. It’s frustrating to think that a suburban market-rate project surrounded by a parking lot has no opposition, but a transparent project with affordable housing and a lot of community benefits gets so much grief. 6. For home-builders or those looking to build a palatial estate, here’s your latest opportunity – 5.45 acres at the end of Campbell Avenue in Ithaca city are up for sale. The area’s zoned for single-family homes, and the city is encouraging owner-occupied houses in that area. Previously, the property was seen as a potential 10-lot development in the late 1980s/early 1990s, but the plan was never carried out. The biggest barrier is probably that it’s West Hill, where neighbors have taken to going after their neighbors to keep them from subdividing and building homes. 7. Initially, this was going to be a Voice article, but when the revised plans were presented, no renders were included. The Voice’s more general audience wouldn’t be as interested in this piece. But if you’ve read this far, and you read this blog frequently enough, then you won’t mind clickable, expandable site plans (pdf here). The Hotel Ithaca is once again seeking to expand its offerings. But this time around, it’s proposing to do in phases. 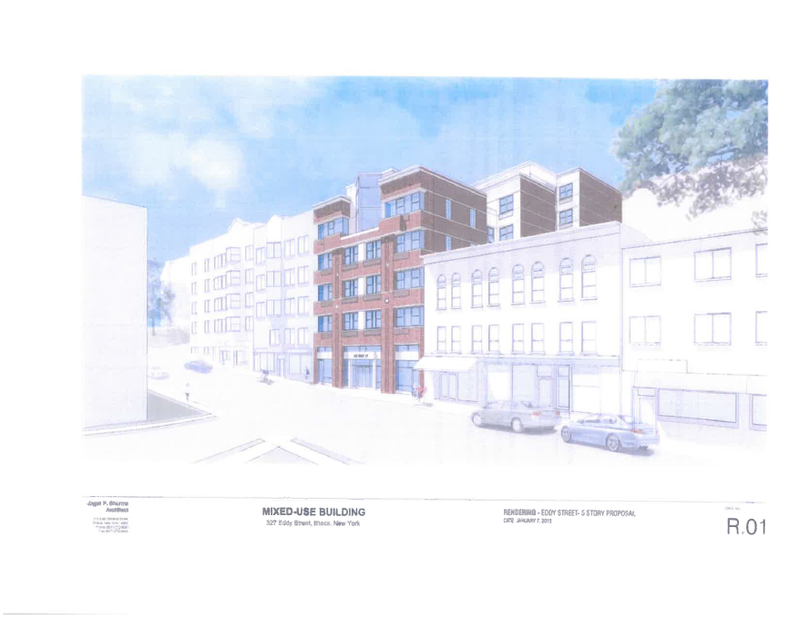 Sketch plans presented at the Planning Board last Tuesday evening call for demolition of the two-story wings as before, but then the construction will be broken up into two phases. 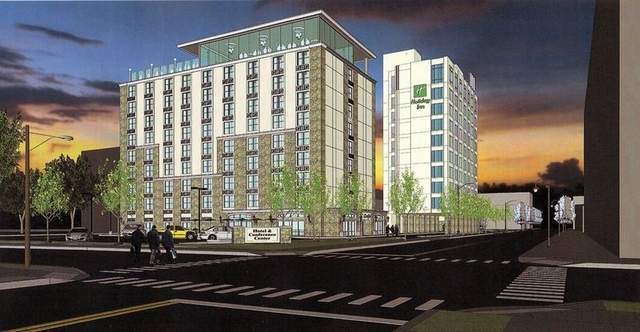 The first consists of a five-story, 51,835 SF wing build on the northern side of the property, next to the gas station on the corner; the second phase, at a later, undetermined date, calls for three more floors on the hotel wing (bringing the new wing to eight stories and 81,600 SF), with a two-story, 18,300 SF conference center to be built on the corner of South Cayuga and West Clinton Streets. The number of rooms in the addition has been unconfirmed, but given previous plans, it is likely to be little to no change from the current hotel, once the two-story wings are demolished. Until phase two is built, a parking lot would sit on the site of the future conference center. The hotel is operated by Hart Hotels of Buffalo. Like several other Hart Hotels properties throughout the Northeast, the hotel has no chain affiliation, although the property was a Holiday Inn until the end of 2013. The 181-room hotel initially opened as a Ramada Inn in 1972, and the 10-story “Executive Tower” was completed in 1984. Zoning at the site is CBD-100 (Central Business District), meaning that a proposed structure can be up to 100 feet (two floors at the least) with minimal required setbacks and no required on-site parking. 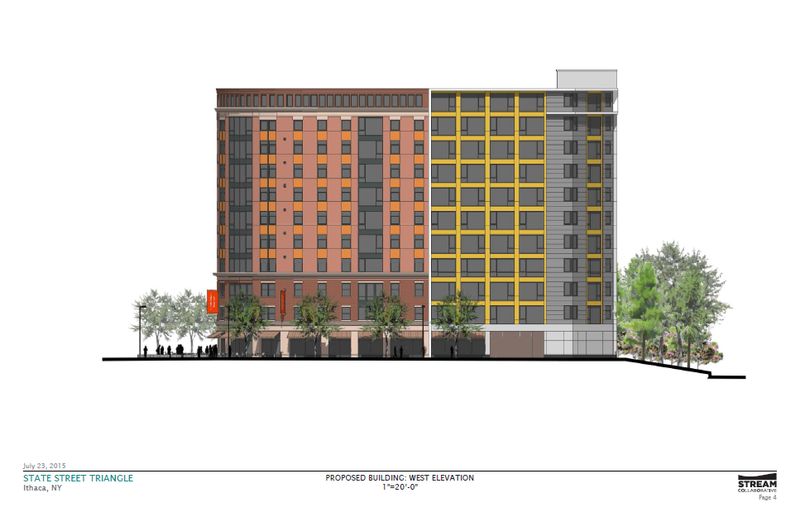 Under plans previously presented three years ago, the Hotel Ithaca sought to demolish the two-story wings of the hotel, and in their place the hotel would would build a new 9-story, 115-room tower, a kitchen addition, and a 15,000 SF conference center. The demolition would have resulted in a loss of 100 rooms, so the net gain was a total of 15 hotel rooms. The then-$18 million project had significant local support from business owners, because Ithaca lacks the ability to host mid-size conferences and conventions (midsize meaning about 500 attendees), which sends conventioneers elsewhere. Currently, the lack of meeting space limits conferences to about 250 guests. The addition of a convention facility is seen as a major benefit to downtown retail, as well as other hotels that would handle overflow guest traffic. Convention traffic typically happens during weekdays, when regular tourist traffic is lowest. However, the project, which was initially slated to start in November 2012, has failed to obtain financing for construction. The project applied for and received a property tax abatement for the new construction, and the Ithaca Urban Renewal Agency (IURA) even offered the possibility of a $250,000 loan if it would create a financial package that would allow the convention center to be built. But until now, there had been no indication of any plans moving forward. 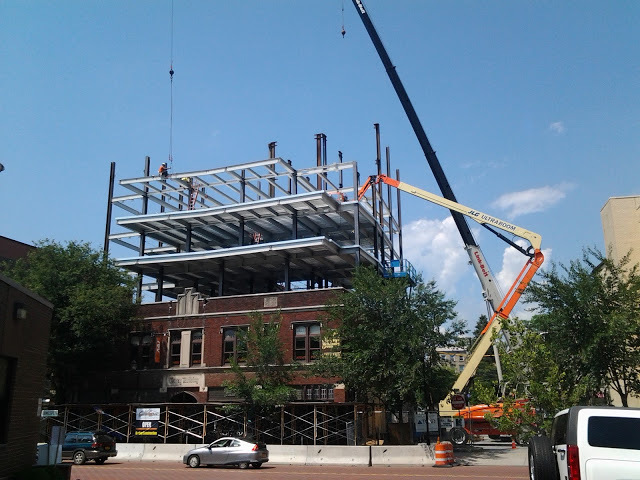 At the Carey Building in downtown Ithaca, work continues on the structural steel beam assembly of the new 5-story vertical addition. 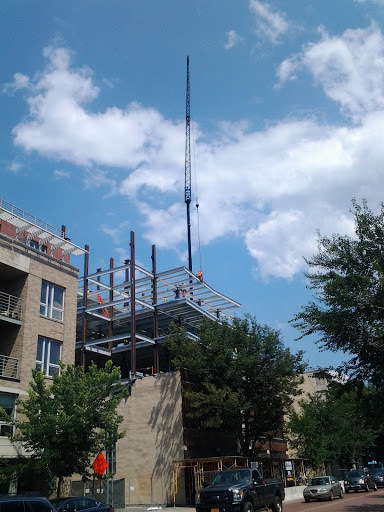 It looks like the lowest two floors of the addition have steel decking, and cross beams are being installed on the third floor. The top two floors, which are smaller, have yet to be built, but one can get an impression of their height by looking at the joining plates attached to the vertical steel columns. 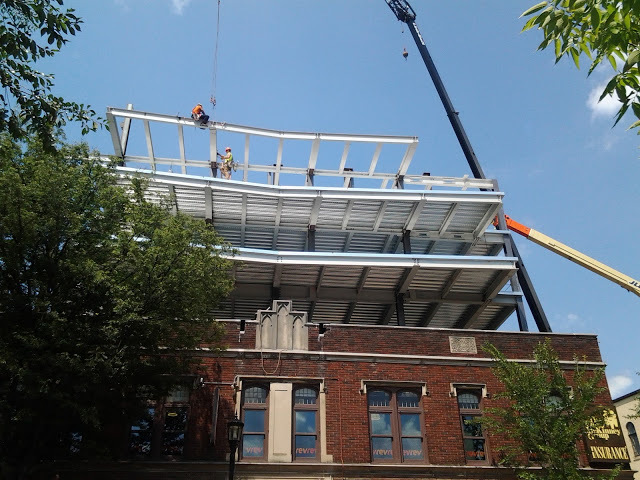 Note the “kink” in the structural steel above the front entrance, and how it relates to the design of the apartment floors. The previous estimates of a late summer/early fall completion have been too aggressive, especially since the addition had to sort out fire code issues, as well as anything else that comes up when working on a 90 year-old building. It would seem that late winter or early spring is more likely, but the steel work should be completed by the end of this summer. 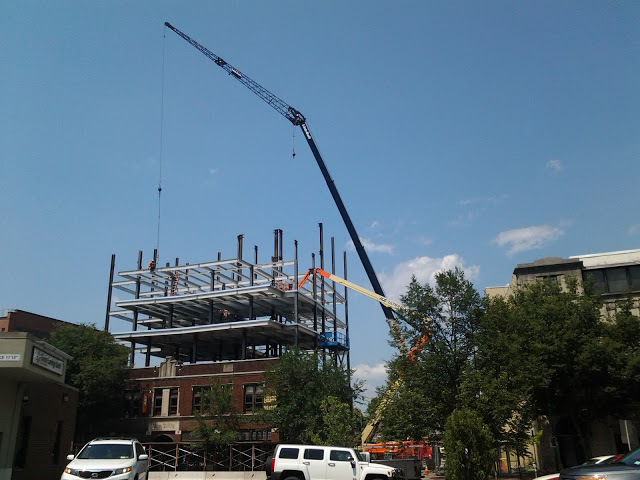 No word on if the Canopy Hotel developers still plan on sharing the telescoping boom construction crane. 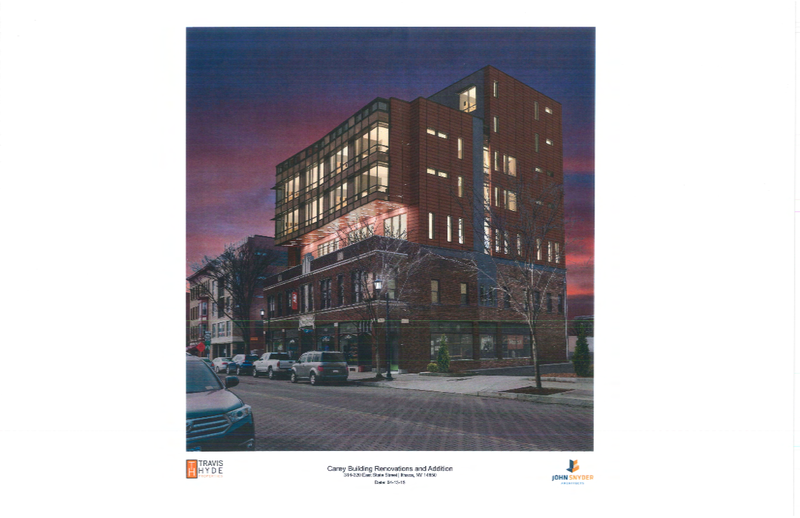 The Carey Building addition will add a third floor and 4,200 SF to the Rev business incubator (nearly doubling it to 8,700 SF), and on floors 4-7, there will be 20 apartments. Floors 4 and 5 will have 16 studio apartment units that average only 400-500 sq ft, their small size enabling them to be rented at a lower price. The 4 units on floors 6 and 7 will be larger 2-bedroom units. The $4.1 million project is being developed by local firm Travis Hyde Companies. LeChase Construction is handling the build-out process. 1. 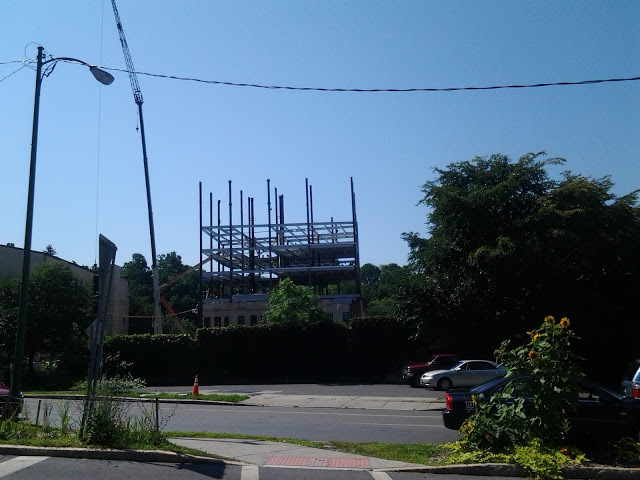 Let’s just outright say it – the Tompkins County Legisltaure’s Old Library decision is a complete mess at this point. As covered last week, there were three separate individual resolutions – one from legislator Mike Lane for the Travis Hyde proposal (first image), and one each from legislators Dooley Kiefer and Leslyn McBean-Clairborne for the Franklin proposal (second image). They all failed. 8 yes’s are required. The Travis Hyde proposal failed with 5 yes and 7 no’s. The Franklin proposal failed with 5 yes and 7 no’s on Kiefer’s resolution, and 4 yes and 8 no’s on McBean-Clairborne’s resolution. Martha Robertson, a supporter of the Travis Hyde proposal, recused herself because she had received donations from Frost Travis during her failed congressional campaign in 2014. Legislator Glenn Morey, also a supporter of the Travis Hyde proposal, was absent from the meeting. I don’t see any way this will ever get the eight votes required. Kathy Luz Herrera voted against the proposals because the resolution has a ground lease (meaning the county still owns the land but leases the property), and Dooley Kiefer has stated she refuses to support any of the projects unless they have a ground lease – in other words, these two have mutually exclusive votes. By voting against McBean-Clairborne, Kiefer’s made it clear she will vote against the Franklin project unless it meets her exact specifications. Shinagawa voted against Travis Hyde for not being what the community wanted, but won’t vote for the Franklin proposal unless they guarantee Lifelong’s involved. And Stein has come out in favor of the Travis Hyde proposal. There’s no solution on the horizon. So now it heads back to the Old Library Committee. Sale to the highest bidder and demolition of the library are real options on the table. 2. 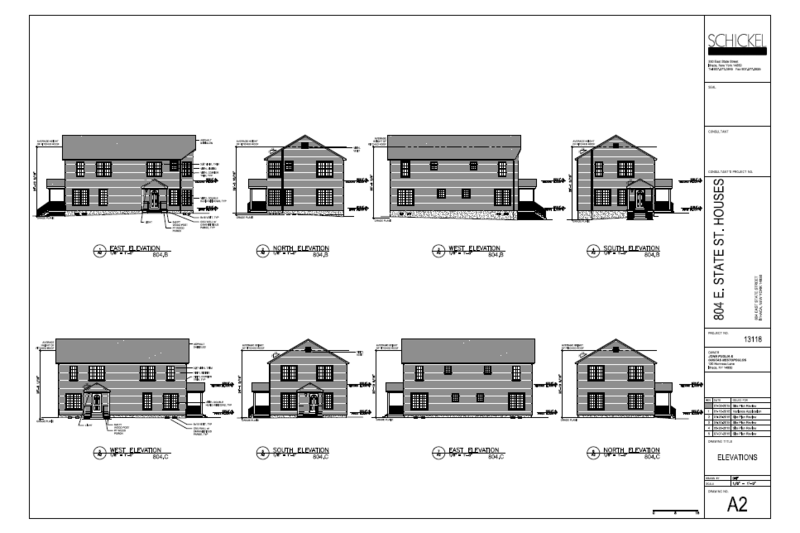 Turning to Lansing town, the planning board there has approved plans for the 102-unit Cayuga Farms townhouse project for a 31.4 acre parcel off of North Triphammer Road near Horvath Drive. First reported last Friday by the Lansing Star, the project received negative SEQR determination (meaning that, following the state’s environmental review guidelines, that the planning board decided the project will have no serious detrimental impact on the community) and issued preliminary site plan approval. However, one issue still remains to be resolved before any shovels hit the dirt – sewer. The project currently has a modular package sewer treatment proposal that would work in place of the voter-defeated municipal sewer, and allow for denser development than the town’s rule on septic tanks. But the DEC’s interest in that type of treatment has been mixed. It could be a while before the situation gets sorted out. Readers might remember this project because it’s one of the few I’ve openly derided. The 102 units are townhouse-style apartments marketed towards the upper end of the market. They would be built in phases over a period of several years. 3. Now for some eye candy. 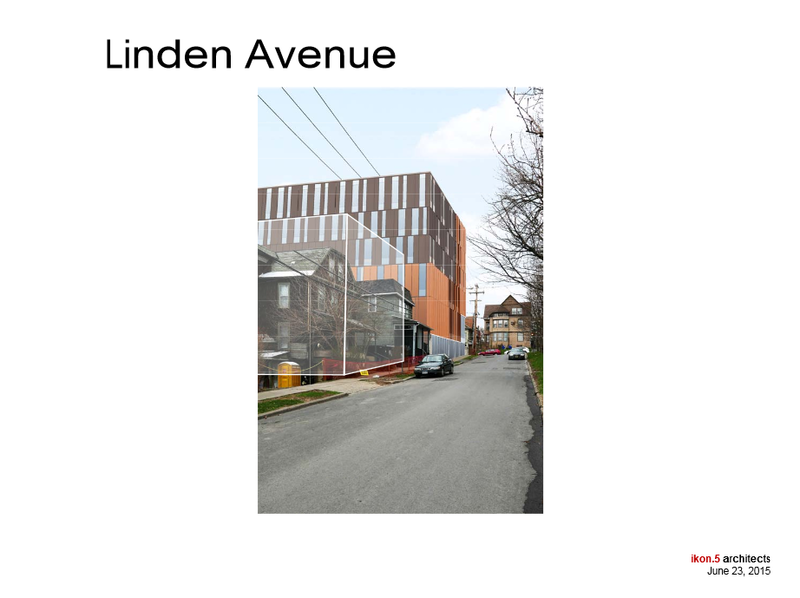 Included with this week’s planning board project review committee agenda are additional renderings for John Novarr’s project at 209-215 Dryden Road. Doing a quick visual cross-check with the initial renderings, there don’t appear to be any substantial design changes, and the colorful metal cladding appears to retain the same pattern as before. Getting a little poetic here, the cascading metal bars are reminiscent of water running down a wall. The city’s Full Environmental Assessment Form doesn’t express many worries about the project; some concerns have been raised about too many pedestrians on the street (the building would add 420 people to Collegetown’s sidewalks at the outset, 600 when fully occupied), but that seems to be about it for now. 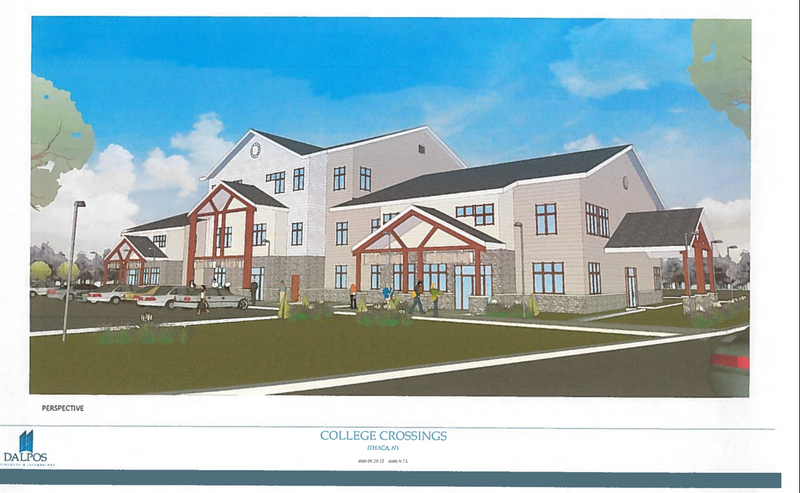 The $12 million project is moving right along in an effort to start construction this fall. Declaration of Lead Agency and some CEQR discussion (the city’s more stringent version of SEQR, State Environmental Quality Review) are expected at the July planning board meeting. Plans call for 76,200 SF building with three floors of classrooms and three floors of offices for Cornell’s Johnson School Executive MBA program. The building would be ready for the Big Red’s B-students in April 2017. The property would remain on the tax rolls. First, popular downtown restaurant Madeline’s is looking to obtain an agency loan as part of a renovation project. The $470,000 project would add three jobs, only one of which pays living wage. The restaurant on the first floor of the Rothschild Building (the two-story building in the above photo) hopes to take advantage of the new hotels going up, and law firm Miller Mayer moving its 60 employees into the Rothschild Building. Previously the firm was in the Chemung Canal Trust Company building further up the Commons. 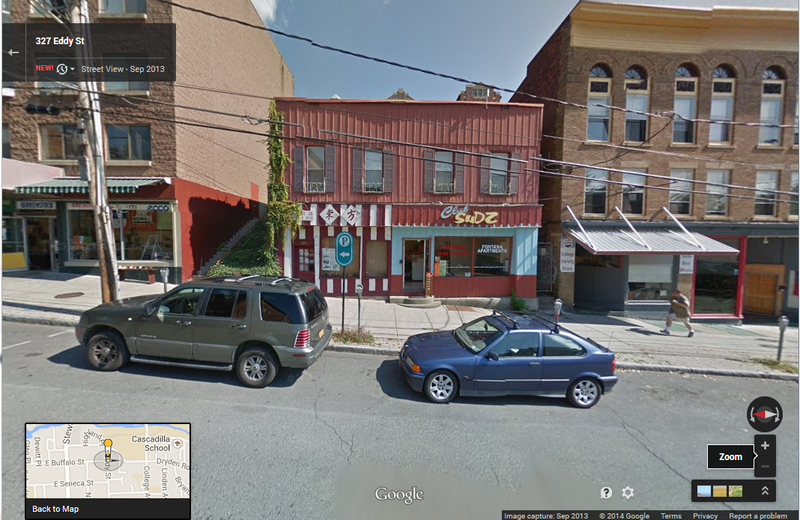 Second, the Finger Lakes School of Massage has applied for an agency loan to facilitate a move from West Hill to downtown. The school would move its ~34 staff and 75-95 students into 10,804 SF of leased space on the Rothschild Building’s second floor, with a further 1,700 SF on the ground level for a retail store and alumni massage clinic. The space would be renovated at a cost of about $194,300. Although both projects come with risks (Madeline’s being a restaurant, FLSM having some worrying financial statements), both projects have been recommended for loan approval. The FLSM and Miller Mayer news suggest that most of the office space in the old Rothschild Building, left vacant when Tetra Tech moved to Cornell’s office park in 2010, has now been refilled. The new window cut out built recently into the Rothschild Building’s east facade is part of the space where FLSM is moving into. 5. And now another reuse project – at 416-418 East State Street, currently home to an underused 7,600 SF office and a connected manufacturing/storage building. The house dates from the 19th century, with various additions as recent as the 1970s. According to plans filed with the city, an LLC linked to Argos Inn architect Ben Rosenblum has plans to convert the old manufacturing space into a bar and storage space, with renovated offices and a 2 bedroom apartment in the original house. The project will include an accessory parking lot, revised landscaping and handicap access. 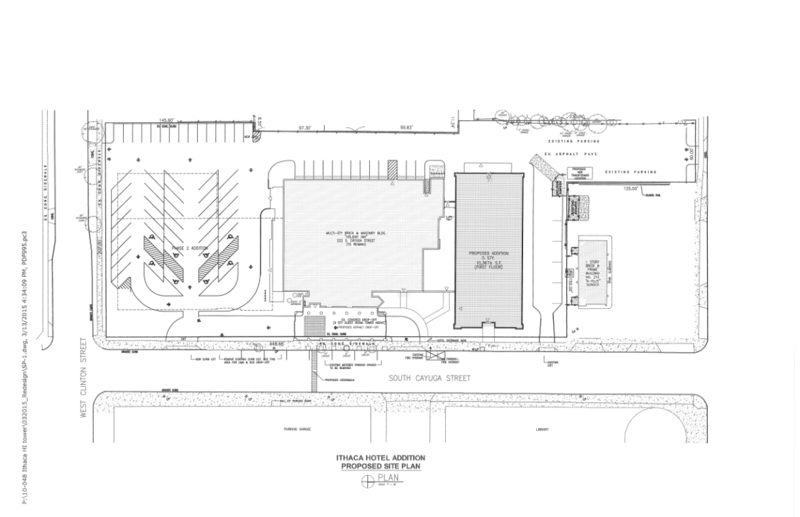 Area and setback deficiencies have resulted in the need for a zoning variance, but a parking variances won’t be required because the bar will have after hours parking across the street at Gateway Plaza. The building itself won’t change dimensions, but the change in use triggers the city zoning laws. There have been some concerns expressed about this project – at least one neighbor is vociferously opposed to a bar, citing noise problems and concerns about smokers, and the county planning department is not a fan of the traffic and parking arrangement. Offhand, I think a bar is legal in B-4 zoning, but the noise impacts will merit further scrutiny. The project is definitely something of interest to the Voice’s audience, but in an email, Rosenblum said that details are still being worked out and that he’d prefer to discuss the plan at a later date. Scott Whitham is serving as a consultant, and local architect Jason Demarest is designing the renovation. 6. 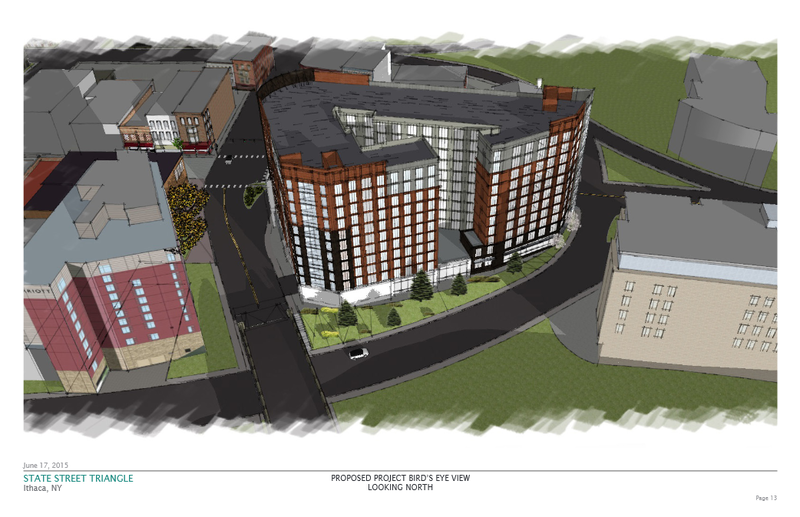 Some very substantial changes are in store for Campus Advantage’s $40 million, 240-unit State Street Triangle project at 301 East State Street in downtown Ithaca. 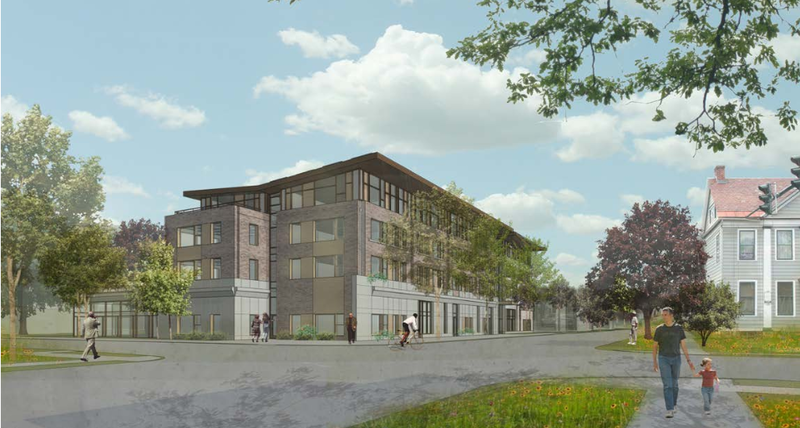 The Texas-based developer has recruited the assistance of Ithaca architecture firm STREAM Collaborative to help redesign the 240-unit project. And there’s clearly been a lot of work since the previous planning board rendition. In this revision, a much greater emphasis has been placed on the street interaction and active street uses. Gone is the soaring corner, and in its place is a design with a greater use of horizontal elements (like the decorative belt above the third floor) in order to give the building a more human scale – crucial when you’re planning one of the largest buildings in Ithaca. The developer is also seeking to remove the northbound turning lane from Aurora onto State Street, and replacing it with a pedestrian area with widened sidewalks, outdoor seating and dining spaces. The land would have to be procured from the city, or some other type of collaboration would have to take place with city officials and engineers. In documents provided in the city’s planning board agenda for next Tuesday, the developer notes that the project remains student-oriented, but in order to play down comments of it being a massive dorm, 10 4-bedroom units were reconfigured into 40 studio apartments that the developer hopes will be appealing to non-student tenants looking for a less expensive, modestly-sized space. The State Street Triangle project is also exploring LEED certification. The project still has a lot of details to be addressed – city transportation engineer Tim Logue has expressed concerns that the traffic study underestimates the number of car trips, and has asked for a revised study. 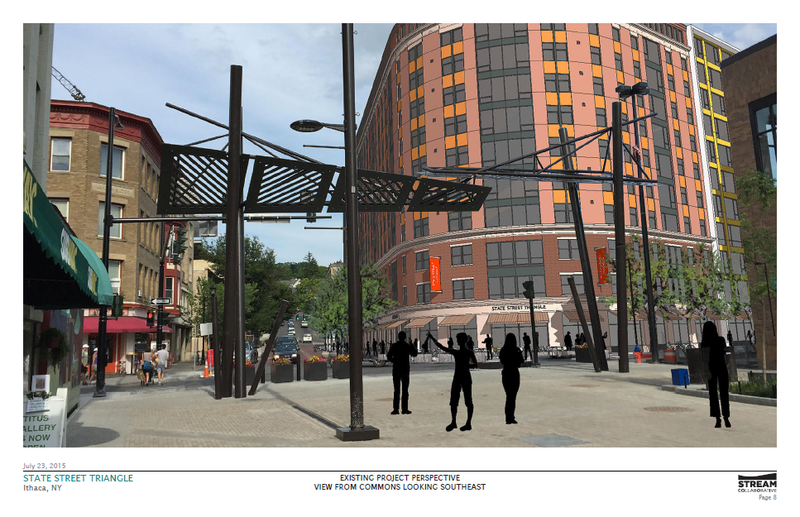 The project is also under closer analysis because the potential addition of 600 residents into downtown Ithaca would put a greater stress on utilities and infrastructure. These and other questions are likely to be topics of discussion at next Tuesday’s meeting. The State Street Triangle may be pursuing a CIITAP tax abatement (so much for my theory a couple weeks ago), but the city has not uploaded the application at the time of this writing. 1. A subdivision at 106-108 Madison Street on the Northside. The applicant wishes to create a new lot on the east side of the existing lot, for the purpose of building a new-single-family home. 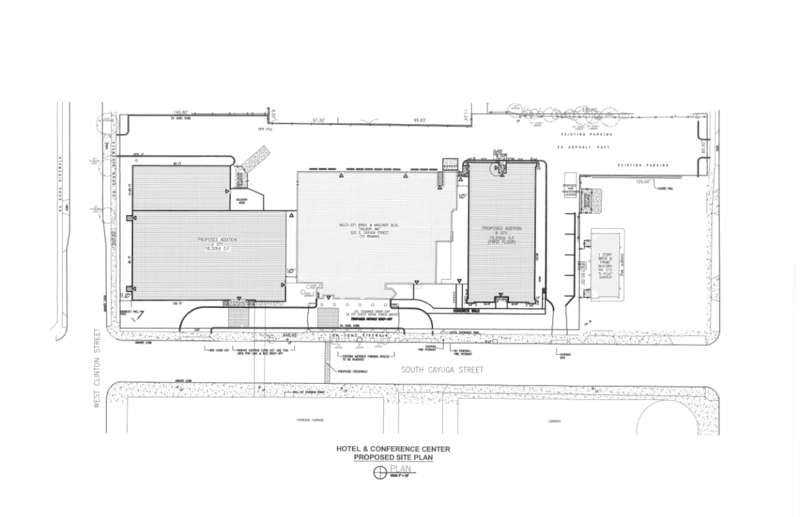 H. Sketch Plan – Hotel Ithaca Expansion. Readers might remember a 9-story addition and convention center were approved for the Hotel Ithaca almost two years ago (shown above). Nothing has happened with the expansion plans, for reasons which had been attributed to financing. Dunno what we can expect this time around, but we’ll find out next week. 1. We’ll start this off with a brief data map, courtesy of Curbed NY. The Urban Institute, a DC think tank, quantifies the country’s affordable housing problem with a detailed study that lays out, county by county across the whole United States just how many units are affordable to what it labels “extremely low-income” (ELI) households, who make 30% or less of county median income. In Tompkins County, this means families of four making $23,200 or less during 2013, the latest year for which data is available. The full report comes with an interactive map. Nationwide, the numbers aren’t very good – in 2013, only 28 of every 100 ELI families could find affordable housing, down from 37 out of every 100 in 2000. In Tompkins County, the situation is even worse – it’s gone from affordable housing being available for 19 out of every 100 ELI households in 2000, to 16 out of every 100 ELI households in 2013. There was only two other counties in the northeast that fared worse – Centre County, PA, home to State College and Penn State, and Monroe County, PA, a far-flung NYC commuter county. While much of the talk about affordability focuses on the middle class getting priced out, it’s worth noting that the tight housing market and college-centric rental market have had a continued negative impact on what little housing there is for the poorest tiers. 2. Staying on the topic of affordability, the county is all set to sell a foreclosed vacant lot in Freeville to INHS for the express purpose of affordable housing. This was first mentioned on the blog a couple of weeks ago. The 1.7 acres of land off of Cook Street in Freeville is assessed at $25,000, but the county is generously selling the land to INHS for the low price of $7,320, which is the amount owed on back taxes and “required maintenance”. 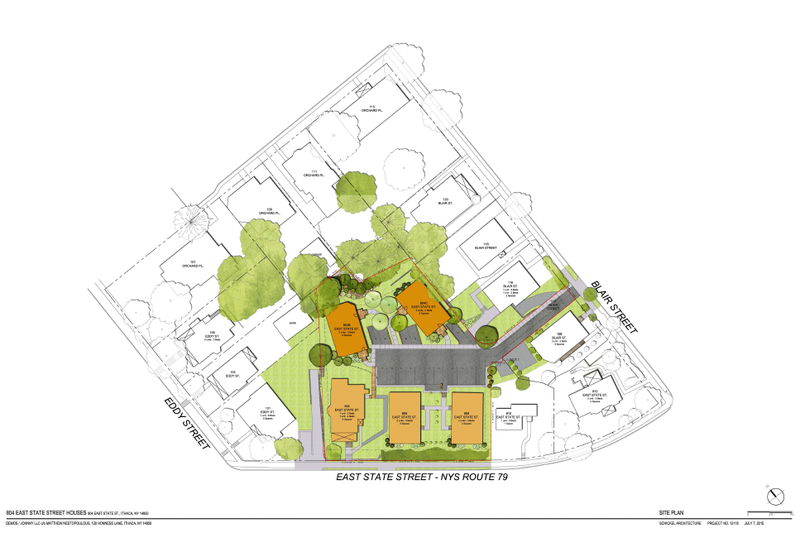 This project would be next to Freeville’s other affordable housing complex, the 24-unit Lehigh Crossing senior apartments south of the parcel. Those were built in 1991 and are managed by a for-profit developer out of Buffalo (Belmont Management). As noted previously, the village of Freeville (population 520) is outside of INHS’s usual realm of Ithaca city and town, but INHS expanded its reach when it merged with its county equivalent, Better Housing for Tompkins County (BHTC) last December. 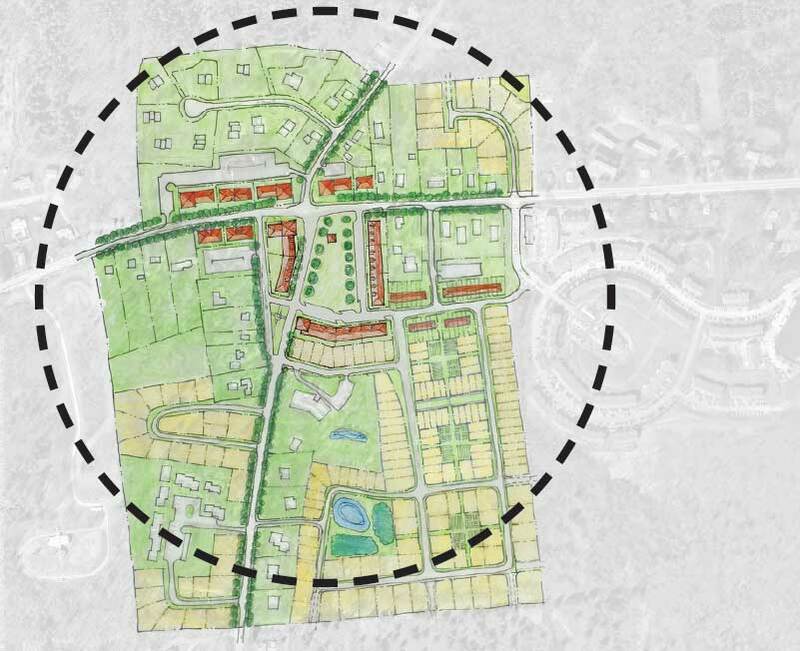 This is likely to be the first new rural project post-merger, and the first new affordable housing development outside of Ithaca in several years. BHTC had a string of failures prior to the merger. For INHS, after the controversy with Stone Quarry and 210 Hancock, taking on a development site that’s likely to have less opposition will be a welcome change of pace. 3. No full decisions from the Board of Zoning Appeals on the 210 Hancock project, but there was plenty of acrimony. Of the three requested variances (height, parking and commercial loading), only the commercial loading variance was granted at Tuesday’s meeting, with the height and parking up in the air until additional information is received about pile driving impacts and winter odd-even parking. INHS has just over two months to submit the additional information. The same vitriolic sentiment could be applied for the Old Library proposals, where legislator Martha Robertson has been called out for a possible ethics violation, and emails on the Fall Creek Neighborhood Association listserve have turned unpleasant. All in all, it’s been a pretty harsh week for anything related to development in or near Fall Creek. Some of the 210 opposition is upset that they’re being perceived as “classist”, but when the gentleman leading the opposition posts tweets like this to the #twithaca page for all to see, a negative reaction shouldn’t be a surprise. As for the old library debate, the legislature’s Old Library Committee met on the morning of the 10th, but no endorsements were made. 4. 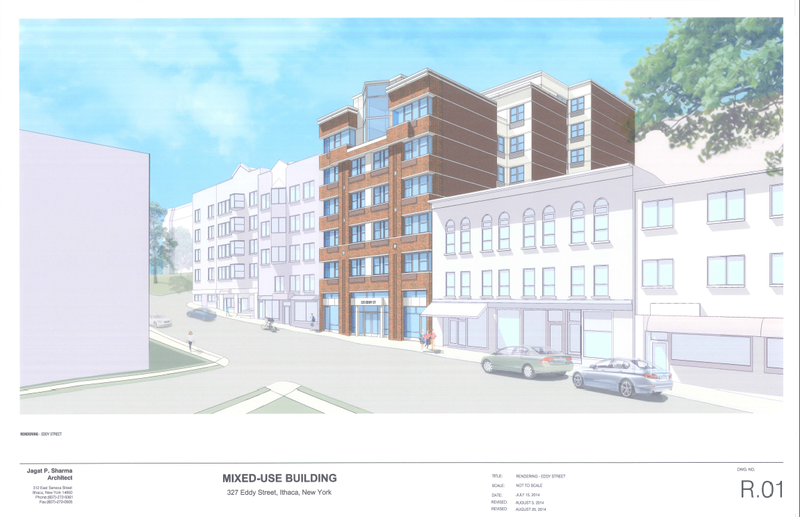 A couple of details worth noting for ILPC’s meeting next Tuesday – “early design guidance” for work planned at 201 W. Clinton Street, and “discussion” about 406 and 408 Stewart Avenue in Collegetown. 201 West Clinton, also known as the Hardy House, was built around 1835, and was previously the home of the local Red Cross chapter from about 1922-2011. After the ARC moved out, it was restored and converted back to a private residence. The house was more recently reviewed/approved for solar panels, and I dunno what’s in store for this next round. As for 406 and 408 Stewart Avenue, those would be the addresses for the historic (ca. 1898) three-story red-shingled apartment house destroyed during the Chapter House fire last Spring, and the fire-damaged but still-standing apartment house to its north. They are/were operated by CSP Management, the same folks tending to the Simeon’s project. So let’s keep hopes up for a possible rebuild faithful to the original 406. If you still need your weekly dose of crazy, here’s a rather paranoid screed submitted as part of an application to the ILPC. I can only imagine the committee’s initial reaction to this. 5. 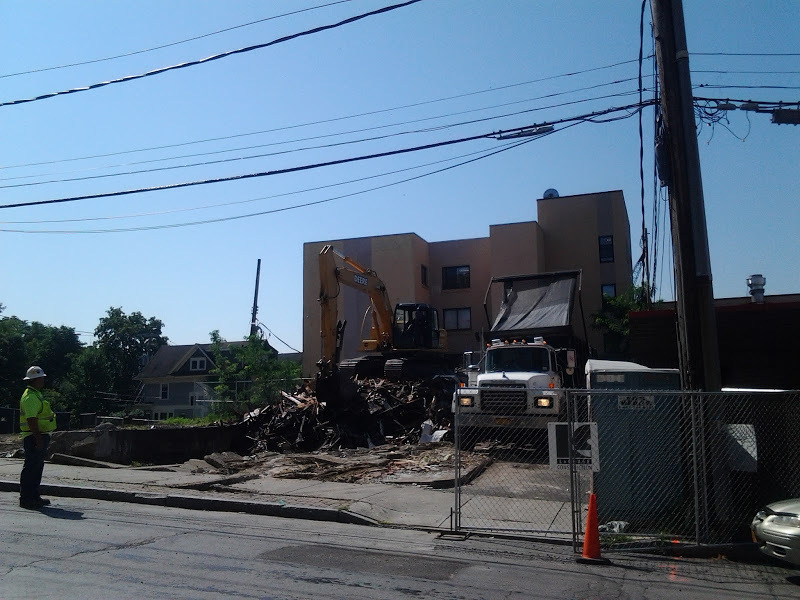 Time to move another Collegetown project into the “under construction” column – 307 College Avenue, a.k.a. 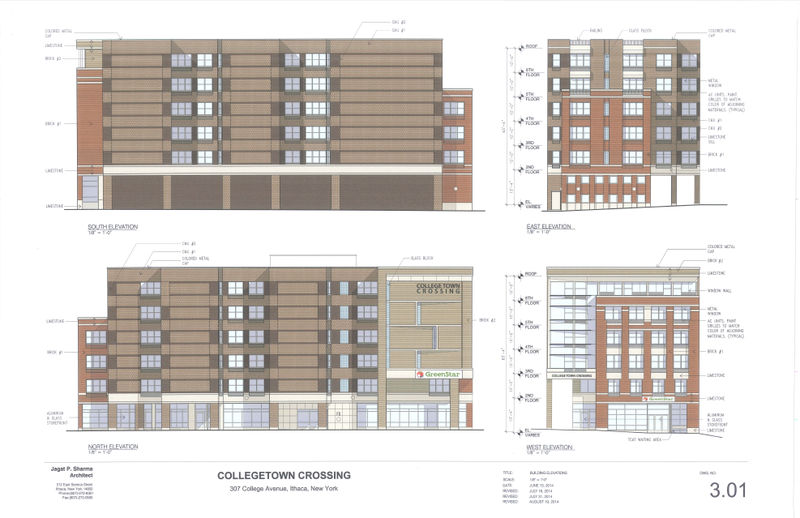 Collegetown Crossing, will hold a formal groundbreaking on Monday at 10 AM. 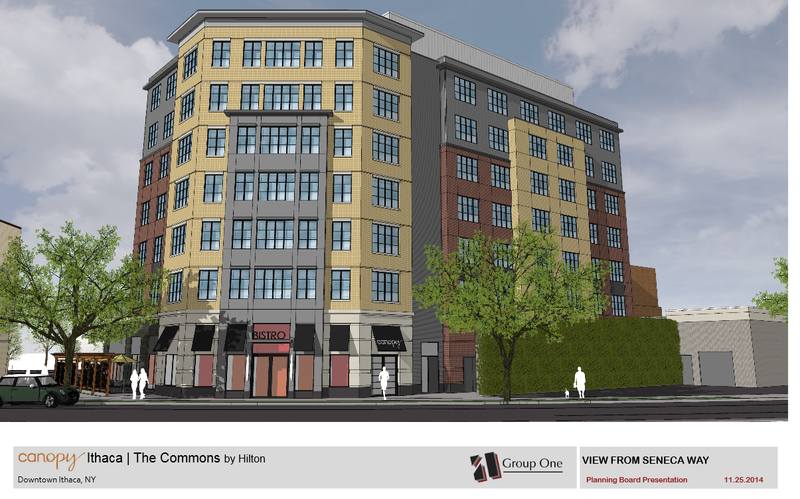 The 46-unit, 96-bedroom project was approved last September after a years-long debate over parking; the project was only able to move forward when the new Collegetown zoning went into effect last year. Expect a 12-month construction period, with occupancy likely in August 2016. 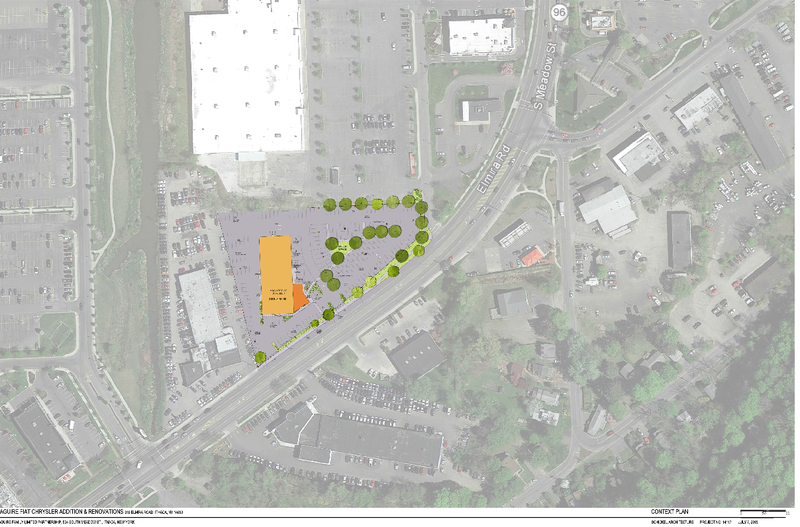 Collegetown Crossing, which also includes a 4,000 sq ft Greenstar grocery store branch, a pocket park and a TCAT transit hub, is being developed by the Lower family and their company Urban Ithaca. 6. Looks like we’re on to another iteration of the proposed pair of duplexes at 112 Blair / 804 East State Street in outer Collegetown. Updated file here, previous plans here. It kinda feels like there’s a disconnect going on – the neighbors basically don’t like the houses for being boring pre-fab duplexes; the developer, Demos/Johnny LLC (Costas Nestopoulos), doesn’t want to change that, but is willing to adjust the site layout and invest in extensive landscaping in an effort to hide them. The two sides have met and they seem close to a compromise. Rather unusually, the 12-bedroom project (4 units with 3 bedrooms each) will open to student tenants in January 2016, after a construction period of September-December 2015. Being a small project, there will probably be enough intersession shuffling to make it work. 7. Here’s another small project getting a revision – the Maguire Fiat/Chrysler addition down in bog box land. Still adding 20 display spaces, but the addition has grown from 1,165 SF in the last version to 1,435 SF, include a small 418 SF second story intended as a lunch room. This project, which will need an area variance, is also looking at September-December 2015 buildout. 1. 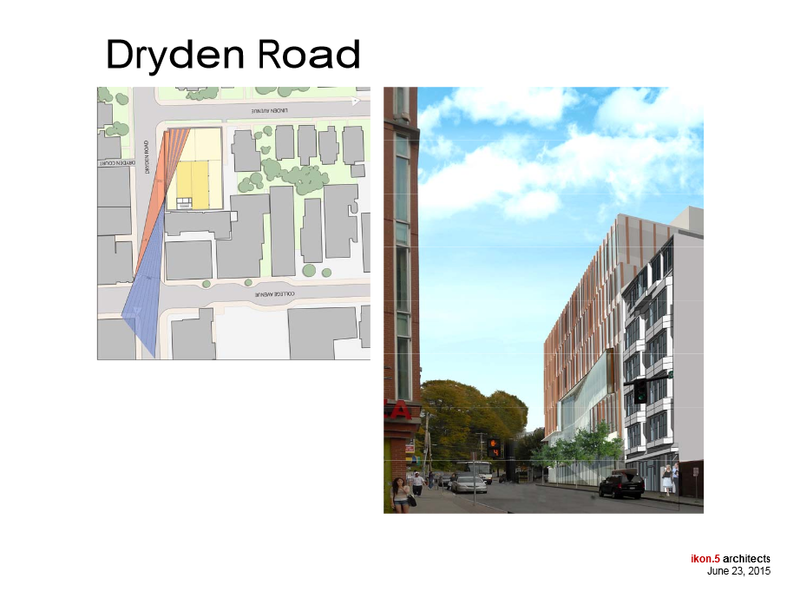 Starting this off with least controversial news-maker this week – John Novarr’s 209-215 Dryden Road project, which I wrote about for the Voice here and with site plan details and SPR/render links here. The first article’s a little helter-skelter as a write-up because there was a lot of frantic 11:30 PM fact-checking going on in an effort to get the news out. 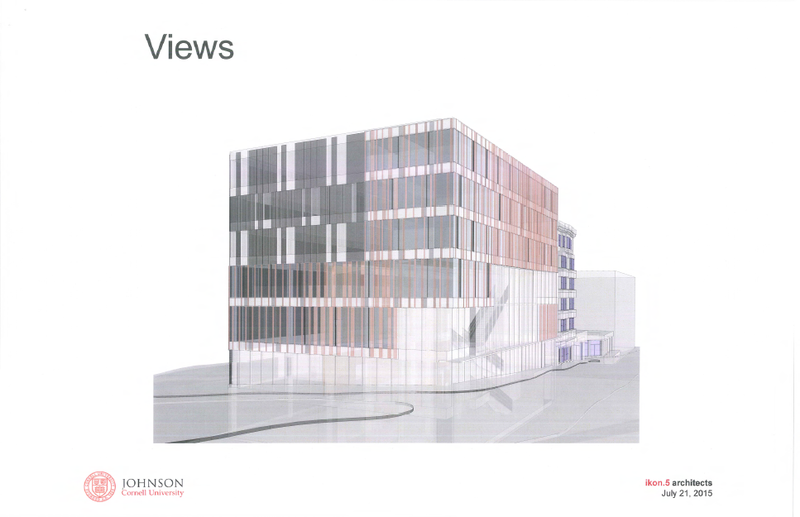 The $12 million, 12,000 sq ft proposal is smaller than Collegetown Dryden, but more importantly, the project isn’t residential; it’s classroom and office space for Cornell’s MBA program, three floors for each of those uses. That definitely brings something different to Collegetown and its mostly residential focus. With assurances given that the property will be kept on the tax rolls, the initial opposition appears to mostly be related to the design, which to be honest, is rather avant-garde and an acquired taste (not one I’ve acquired, to be honest). However, bringing 200 staff and a few hundred professional students into Collegetown would be a real asset for businesses struggling to stay open amid the neighborhood’s 32/36-week profit window. 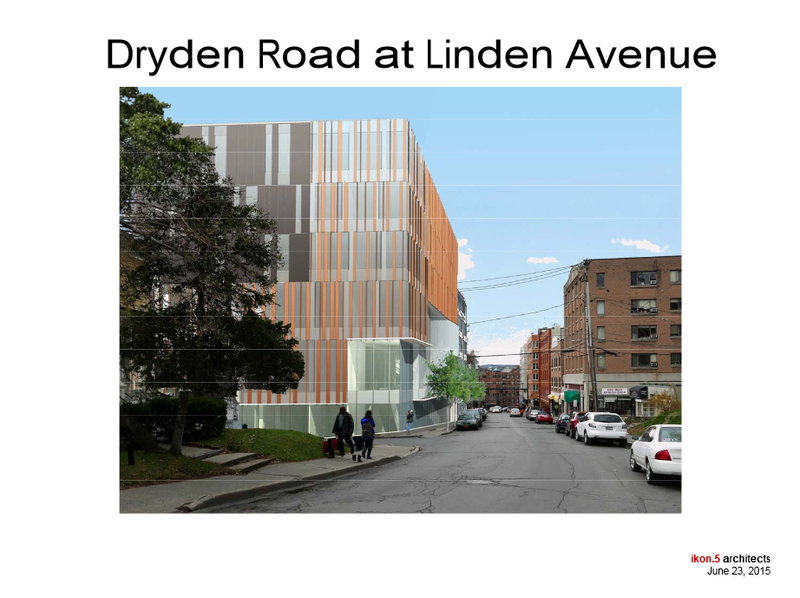 209-215 Dryden Road is within the MU-2 zoning from the looks of it, so a trip to the Board of Zoning Appeals (BZA) seems unlikely at the moment. We’ll see what happens moving forward, this one could be a fairly smooth approvals process. 2. 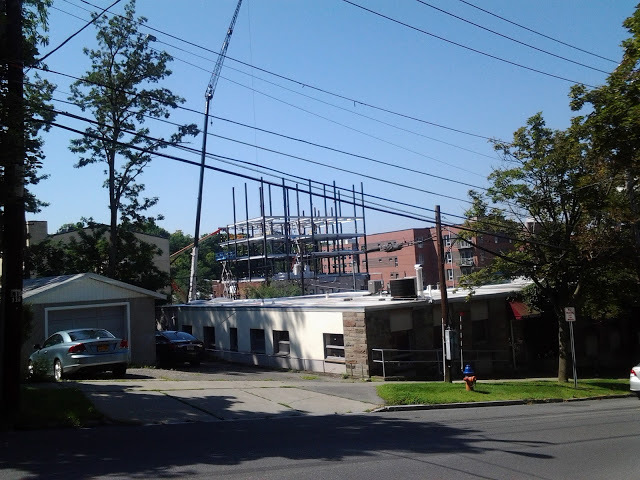 For a smaller developer, Ithaca-based Modern Living Rentals has been pretty busy this year. Along with 707 East Seneca Street and 902 Dryden, they have a modular duplex (3 bedrooms each, 6 total) currently under construction at 605 South Aurora Street in Ithaca city. A construction permit was issued back in 2014, according to the city planning report. The orientation is a little odd in that the new duplex is being built in front of the old home on the property, since the house is longitudinally centered but set back on its lot. Taking a guess, the intended market is likely IC students. The new units look like they’ll be ready for occupancy in time for the fall semester. 3. 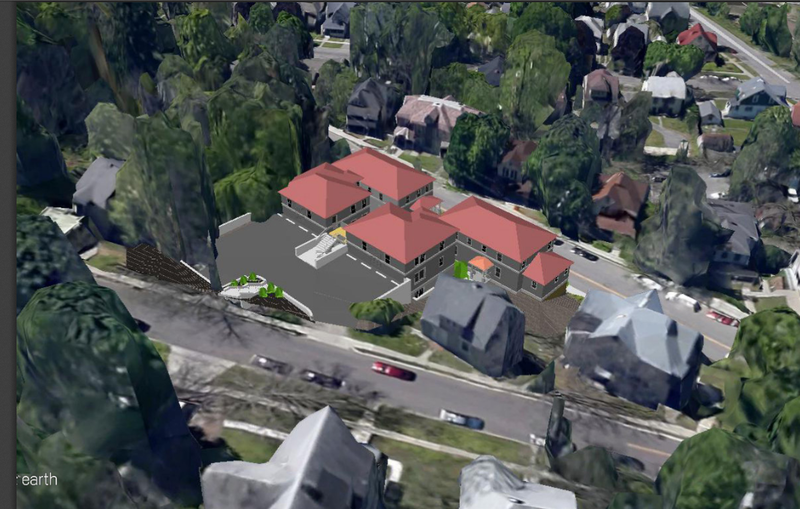 Here’s an interesting piece of news, courtesy of the Tompkins County Government Operations Committee – plans to sell a vacant lot to non-profit housing developer INHS. In its May minutes, the committee announced intent to sell a vacant, foreclosed parcel in Freeville for affordable housing. The property is described as a 1.72 acre parcel on Cook Street in the village, which through a little deductive searching, turns up the lot in the map above, just north of the Lehigh Crossing Senior Apartments. The minutes state that INHS is in the process of drafting up an acquisition offer for the county attorney. Freeville is outside of INHS’s usual realm of Ithaca city and town, but INHS expanded its reach when it merged with its county equivalent, Better Housing for Tompkins County (BHTC) last December. This might be the first new rural project post-merger. The Lehigh Crossing Apartments have 24 units on 2.3 acres, so if INHS were to build at the same density, this site would be looking at something around 18 units. 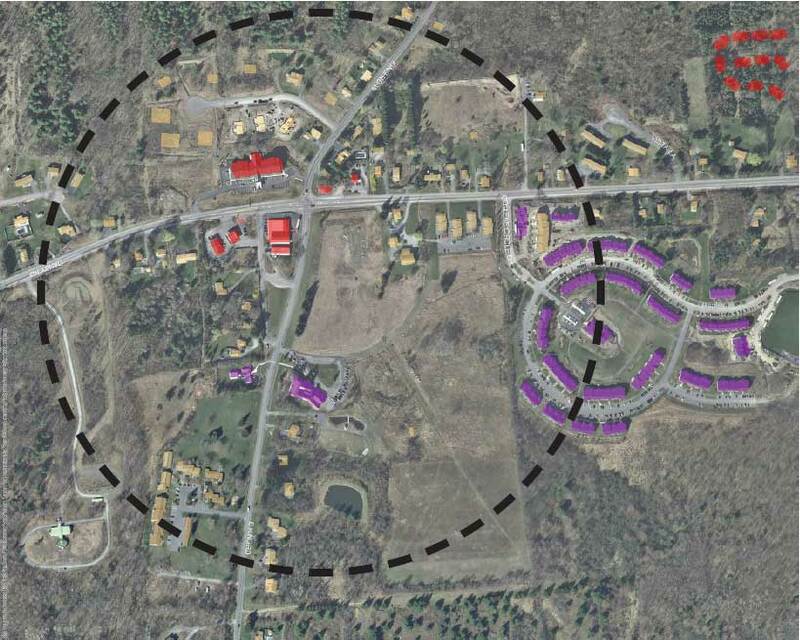 Not big, but not inconsequential, especially for a 520-person village. 4. A decision to decrease sewer hookup costs in Lansing village also shares some details about a senior housing project in the works. The news comes from the Lansing Star, where the village voted to decrease its sewer hookup fee from $2,350 per unit to $1,000 for the first unit and $500 for each additional unit. Apparently the high fee was the result of the lack of a permitting process in the 1990s. 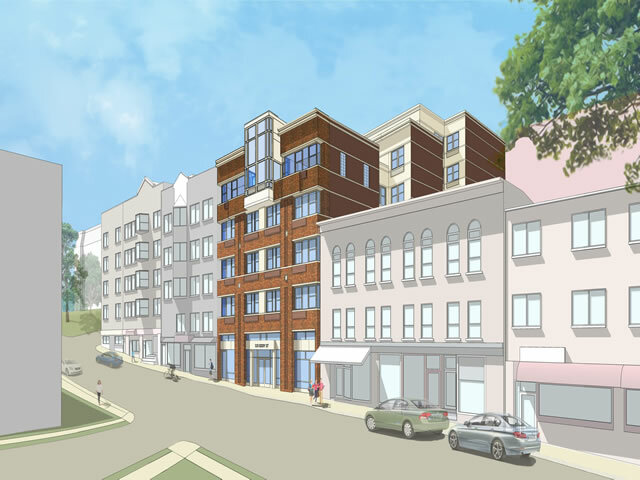 The article notes that the developer of a mixed-use request had requested a fee waiver because it would have cost $138,650 for their “59 units of senior housing”. Now it will be $30,000. Not as good as a waiver, but still pretty good. Lansing village only has one project that meets the description provided, the 87,500 sq ft Cinema Drive project covered here previously. The semi-educated guess back in May was 51 units, so the ballpark estimate wasn’t too shabby. 5. It’s official, 327 Eddy is under construction. Asbestos removal has been completed and the Club Sudz building is coming down. The Fontanas hope to have the building completed and ready for occupancy by next August. In replacement of Club Sudz’ and Pixel’s 7 units and 2,500 sq ft of commercial space, the new 5-story building will bring 1,800 of retail space and 22 new units with 53 bedrooms to the market. Eagle-eyed readers might recall the building was originally going to be six floors, but a floor was lopped off since it was approved. 6. Updated renders for 215-221 West Spencer Street, coming right up. A little more detail on the facades, some window updates from the last version, and…well, honest personal opinion…it’s a very attractive design. Materials could underwhelm it, but as presented, it appears to be a lovely addition to South Hill. Good work STREAM Collaborative. 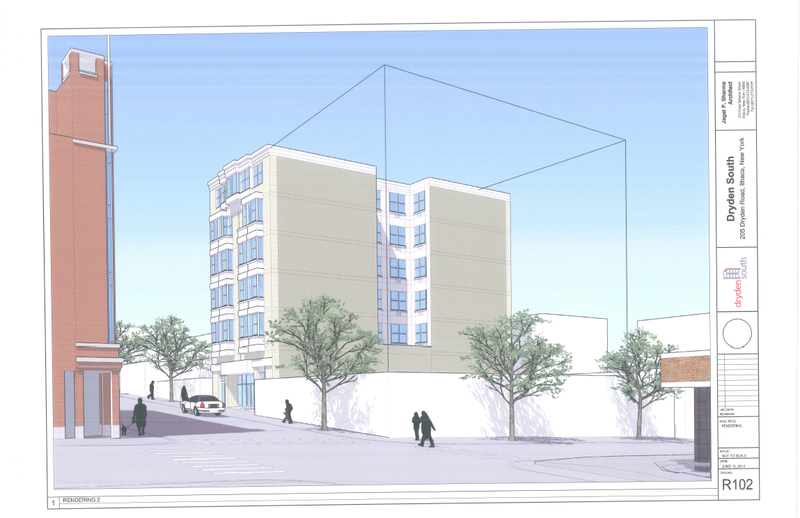 The 12-unit, 26-bed project plans to start construction next year. 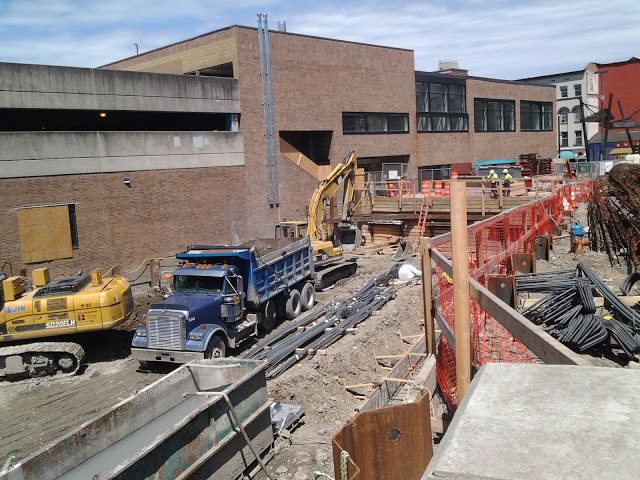 The project replaces an informal (dirt) parking lot. 7. 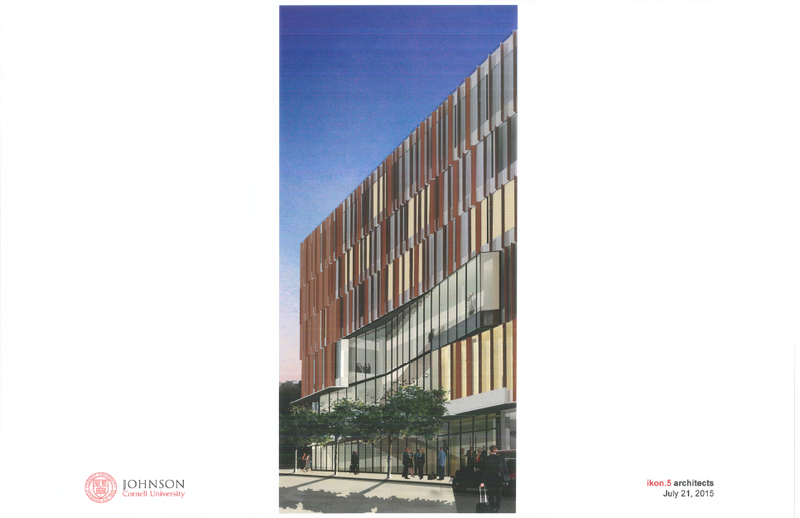 Touching on the Old Library decision briefly, a public meeting on the two proposals will be held Monday June 29th at 6:30–8:30pm at Greenstar’s “The Space” (700 West Buffalo Street). Douglas Sutherland will represent Franklin Properties (first image) and Frost Travis will be presenting for Travis Hyde. Should the County Legislature decide to take another vote to see if the stalemate will be broken, the next chance will be at their July 7th meeting. EDIT: The public meeting scheduled for the 29th has been cancelled . 8. Onto the thornier topics – Not sure what was worse this week, the reaction to the State Street Triangle project, or the INHS Hancock Street opposition. The objective, non-partisan write-up about the State Street project is on the Voice here. This and news piece #9 are opinion pieces, feel free to ignore them. 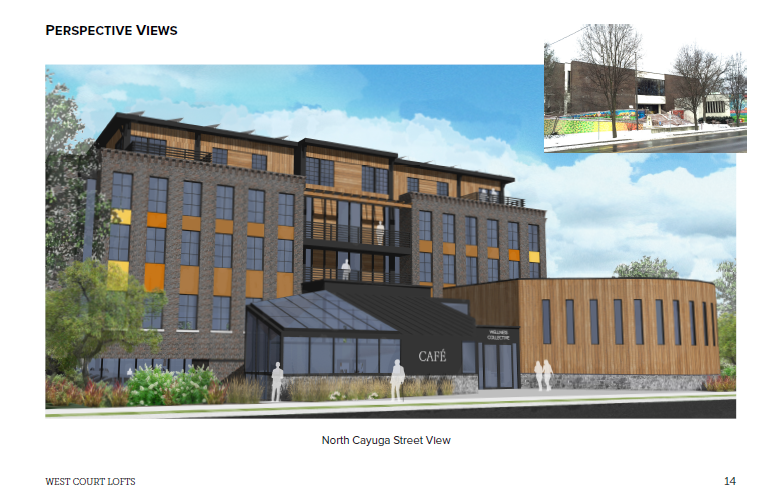 At least the State Street objections (latest renders here), I can understand the initial shock and recoil; there’s this perception that Ithaca is a small town, and this doesn’t jive with that. Regardless, by Ithaca standards it is massive, 11 stories with 289,000 sq ft of space and 620 bedrooms; if this was, say, a four-story building with an 11-story tower on the closest third to the Commons, the reaction would probably be less vitriolic (people would still hate it, but let’s entertain this thought exercise). But that probably won’t happen. Not with this developer, or with any developer that purchases the Trebloc site. Here’s my theory why, and it goes a little more in-depth than “they want maximum profit”. In December, Jason Fane’s 130 East Clinton project was rejected for tax abatements, and one of the reasons cited was that market-rate housing wasn’t enough of a community benefit. State Street Triangle is mostly apartments – it contains only a modest amount of retail space, with less than 13,000 sq ft it’s not even 5% of its usable space. If it were to apply for an abatement, it would likely be rejected for the same reason. Arguably, they could try commercial office or even industrial “maker spaces”. But the market demand for office space doesn’t seem to be growing much, and industrial uses don’t tend to be a good fit in heavily populated areas. A developer could even try condos, but if developers knowledgeable with the area are hesitating, than a bank won’t hesitate to hold off on financing (aside on that – if the Old Library goes condo, other developers and financiers will view it as an experiment, or more positively, a pioneer; until it’s clear that the project is successful, don’t expect more condos in Ithaca). However, nothing changes the fact that building downtown is quite expensive. So, being a for-profit company, if you want to build in an expensive area, you have two options to ensure return on your $40 million investment and get the construction loans you need – build as much as possible, and/or make your units as expensive as possible. If you’re a company that specializes in student housing, you’re not going to push the latter because there’s a lower ceiling on what students can afford. That would be my guess on how State Street Triangle came to be. There are a few possibilities that might make the project more palatable to community members, such as free bus passes for tenants or a 10% affordable housing requirement within the tower (if the INHS project oppositions are any clue, this is going to be the only way to go from here on), but given the costs, those ideas just might kill the project completely. Which is exactly what some folks are looking for. Let’s see what they and the developer can negotiate here. 9. Now for 210 Hancock. Here is a project that’s been transparent, incredibly transparent, throughout their whole planning process. At first, there was little opposition. Now, it threatens the proposal, apartments, townhomes and all. A wise man once told me in when I was preparing a piece, “There’s no point in talking about this with you, the public’s going to have issues with it either way”. At this point, I’m inclined to believe him. I’ve read the petition, and I’ve read the facebook comments. It’s regrettable, to say the least. A lot of the comments just seem to be misinformed. People saw the petition, thought that INHS was only building the apartments, and signed it. The petition was worded with charged and selective language. I’d like to take a few minutes out to refute and argue some of the commentary. You’re right. 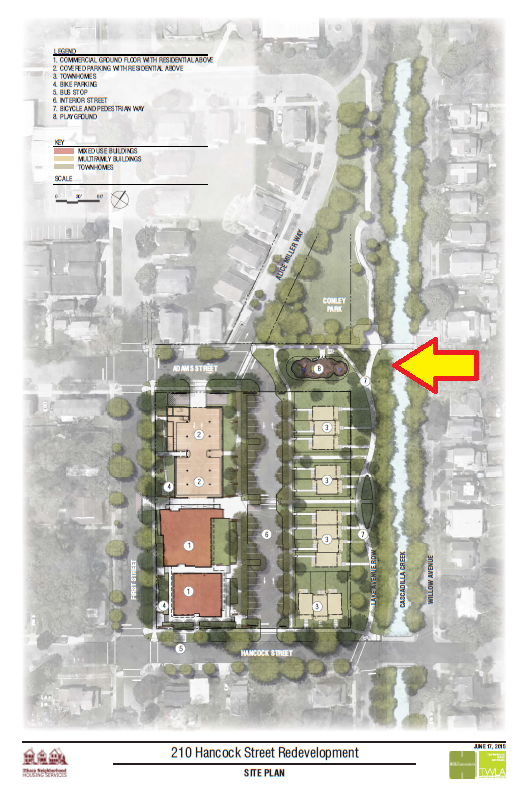 That’s why the project, as proposed by INHS and tweaked by the city Planning Board, builds a playground that blends into Conley Park without the threat of vehicular traffic (shown in the plan below). Adams Street and Lake Avenue would be removed, allowing kids living in the apartments and townhomes to go the playground without crossing any street. The rental vacancy rate is 0.5%. A healthy market is 3-5%. Further to that, if there are dozens of homes, even if they were for sale, it’s still not enough to handle the demand, which is in the few thousands. 84 parking spaces are required by zoning, 64 are proposed. 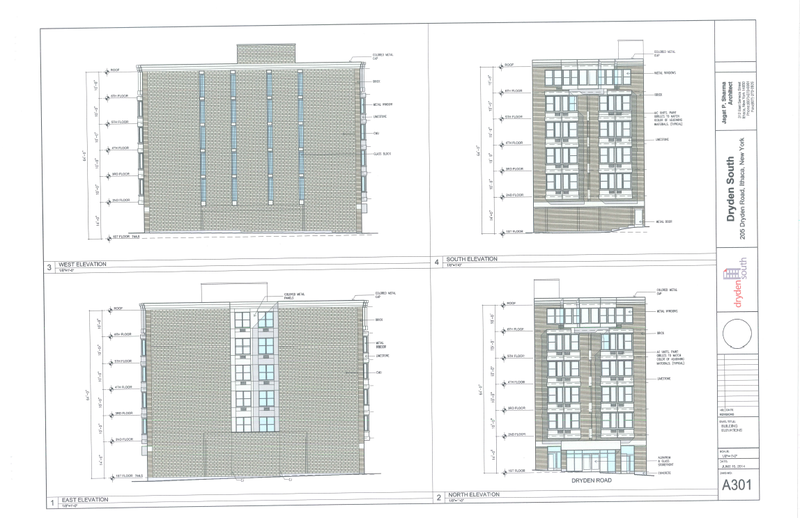 However, only 22 spaces are expected to be used by the 53 apartments. In the parking study of INHS tenants, 41% of apartment tenants have 1 car, 12% of those have two. One of the reasons why INHS’s parking utilization is so low is that many of its apartments are rented by seniors – for example, Breckenridge Place is 60% seniors on fixed incomes. With limited mobility and/or income, many don’t maintain personal cars. 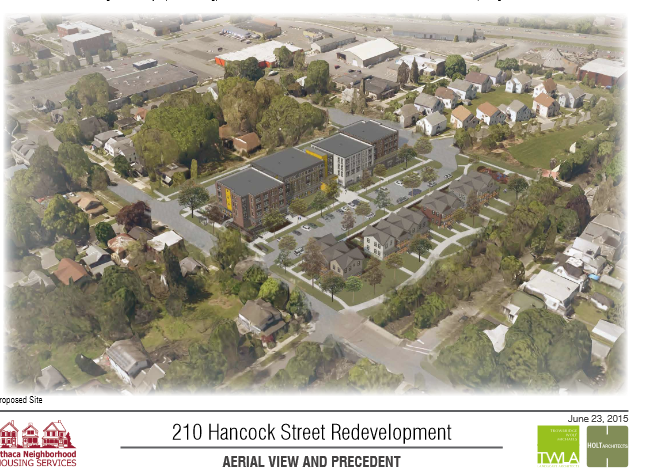 In a sense, although the Cornerstone project for affordable senior housing wasn’t selected by the Old Library site, the INHS project on Hancock Street may serve in some ways as a reasonable alternative. INHS is a non-profit community developer. The townhouses sold at Holly Creek over the past year were in the $105-$120k range. For comparison’s sake, the townhomes in the Belle Sherman Cottages sold for double that, and those aren’t even considered high-end (high-end would be the $410,000 townhomes in Lansing’s Woodland Park). The reason why construction won’t start until Fall 2016/Fall 2017, with the apartments finishing up in Fall 2017/Fall 2018, is that they are completely reliant on government grants and donations from community supporters. The townhouses won’t start for a couple of years (their time frame is 2018-2020) because funding for purchasable units is more difficult to get. Just like with the condominium debate, the government is more likely to disburse a grant if it knows there are buyers waiting in the wings. And for low and moderate-income households, far more are capable of renting versus buying. As for the rent-to-own option suggested by the petition writer, it’s speculative, complicated, and NYS/federal HUD will not provide grants for that type of property acquisition. INHS couldn’t do it if they wanted to. For starters, it’s harder to make housing affordable if there are fewer units on the a plot of land. Secondly, because the INHS project takes lead on the city’s right-of-way (ROW) on Lake Avenue and Adams Street, the calculated density per acre is 23.6 units per acre. Cascadilla Green, one block to the north, is 20 units per acre. Also note that units are 1 and 2 bedrooms per unit; most of the houses on blocks in Northside and Fall Creek are 3 bedrooms per unit. What probably bothers me the most are some of the comments in the online petition for INHS. One of the reasons I harp on affordable housing is that I grew up in affordable housing. This 147-unit mixed-income complex in suburban Syracuse. Apartment 28E. I shared a bed with one of my brothers until I was 10, and even after my mother was finally able to buy a small ranch house, we shared a bedroom until he graduated and went to college two years before I did (by that point, we had moved on up to bunk beds). My mother did what she could. We were never more than working class, but she worked hard (still does) and made sure her kids worked hard. At least some of the comments are kind enough to be “I want affordable housing but”. Others really make it sound like that those in need of affordable housing are a contamination of the community. Those statements aren’t worth debating. They’re just hurtful. Anyway, this might be the longest news update I’ve done, so I’m going to wrap this up and detach from the computer for a while. There may or may not be a photo update Monday night, we’ll see.